The climate type for this species is alpine tundra & boreal. It is usually found between 1100 and 1200 ft. Stored seed requires a period of cold stratification. Fresh seed can be planted and will successfully germinate. Can be stored as a bulb or seed. Can be stored for several years in a cool dark environment. Refrigerated and kept in dark dry area. The seed can be sown as soon as it is ripe in a shady position in a cold frame. Water lightly in summer, it should germinate in autumn or winter. Sow as early in spring as possible in a cold frame. Sow the seed thinly so that it will not be necessary to prick them out for their first year of growth. Give an occasional liquid feed to the seedlings to make sure that they do not become nutrient deficient. When the plants are dormant, pot up the small bulbs putting 2 - 3 bulbs in each pot. Grow them in a shady position in the greenhouse for another 2 - 3 years and then plant them out into their permanent positions when they are dormant in late summer. Not much literature is available about vegetative propagation of this species. Prefers slightly acid soil conditions but succeeds in chalky soils if these contain plenty of humus. Requires semi-shade, preferably provided by trees or shrubs, and a well-drained soil. Succeeds in almost any light soil, preferring one that is rich in humus. 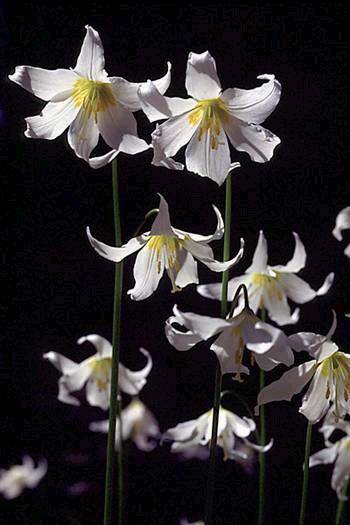 Seeds and bulbs are both a reliable source for propagating lillies and require little cost. In a 14” x 9” tray anywhere from 200 to 1000 seeds can be sprinkled on top of the medium. 2-3 bulbs can be placed in a bucket to let germinate. The medium should be kept moist but should be a light well draining mix so as not to over saturate the maturing plant. 4. E-Flora BC: Atlas of the Plants of British Columbia [www.eflora.bc.ca].